We all love to eat dessert at the end of a meal. So do try something different and very quick dessert recipes. 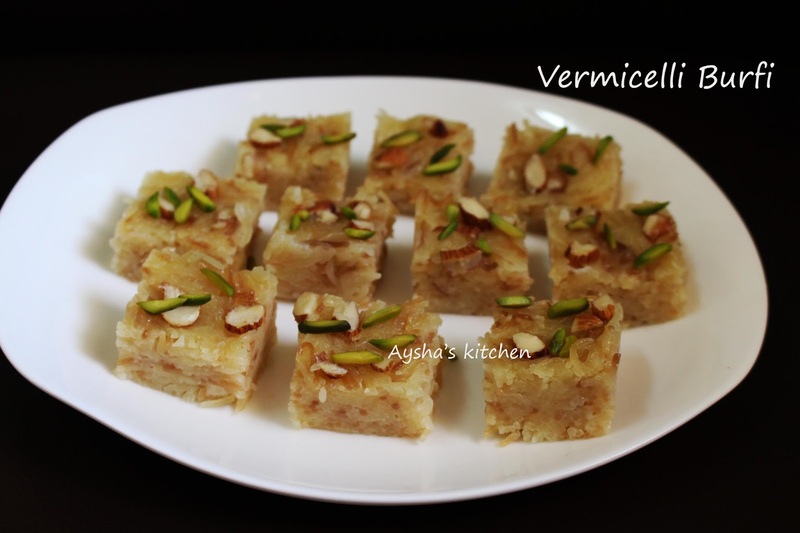 The sweet, nutty and lovely recipe with vermicelli. 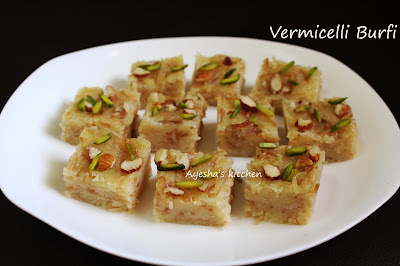 So here it is, a healthy dessert recipe with vermicelli / semiya. It is very tough to search very easy yummy recipes for dessert. This is one of the best dessert recipes for a crowd or a small get together parties. Kids will love this burfi for sure and is healthy too. Hope you all enjoyed this quick dessert recipe and do let me know how it turns out for you. Here is the recipe showing how to make easy dessert recipes for kids / how to make vermicelli burfi at home. Grease an aluminium tray or any flat tray with ghee and set aside. Heat 2 tbsp ghee in a non stick pan and roast the thin vermicelli until slight golden and then set aside. To this, add hot milk (the milk must be hot) and mix well. Let it cook for 5 minutes over a low flame. Now add condensed milk and check for sweetness. You can add sugar and cardamom powder at this stage if required. Add few tbsp of ghee and combine well. Stir continuously until thickens and leaves from the side of the pan . Now pour the mixture into the greased tray and flatten with a spatula to get an even surface. Sprinkle almonds, pistachios and press gently. Refrigerate until it sets or for at least one hour. Once sets, cut into squares and serve.